Product prices and availability are accurate as of 2019-03-28 08:16:59 EDT and are subject to change. Any price and availability information displayed on http://www.amazon.com/ at the time of purchase will apply to the purchase of this product. Ideal for task, accent, office, cove, utility, under and above cabinet lighting display, the Halo under cabinet low-profile design delivers maximum energy savings and life with easy installation. The integrated driver allowing 120V direct to the fixture for easy installation. 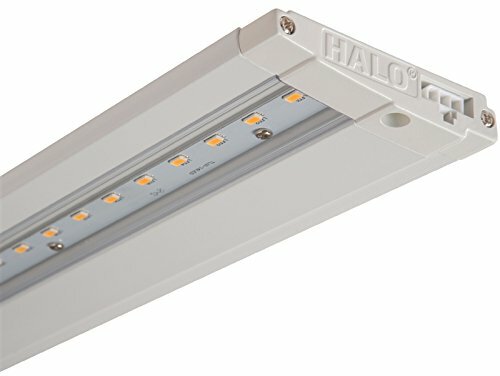 Fixtures are available in 9, 18, 24, 36, or 48 inch lengths, the Halo system can be configured to fit almost anywhere. Smooth dimming down to 5% using a standard dimmer. Connector cables in a variety of different lengths make it easy to link one unit to another. Each unit has an integrated on-off switch.